"New technology in food sciences facing the multiplicity of new released GMO"
The goal of the GMOchips-project is the development of biochips to detect Genetically Modified Organisms (GMOs) in food. More information about the project under: Introduction. 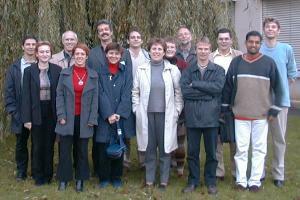 7 Partners out of 5 European countries are involved in the GMOchips-project, organized in 4 Work packages. The Agenda shows the major meetings and milestones of the project. Participants can find internal project information, documents and software in a password-protected Internal section. The Links-section lists addresses of similar projects and sites. A powerful tool for multiple and fast analysis of genes and DNA sequences. An overview of this site (GMOchips.org) is available under: Sitemap. For questions about the project or feedback to this site choose Contact.